Hi everyone, I'm new to the forum. I am a film student a few weeks out from working on my final year film and have a few concerns about setting up lighting in a particular location. The location is in rural Australia in an old shed on a farm. The closest power source is approximately 100 metres (328 feet) from the shed and I need to power a number of high wattage lights simultaneously. As far as I am aware, the power source (house) has two circuits, each with 5000W. Below is a picture of the power box, each circuit has 250V and 20A. My question is this: is it possible to run a heavy duty extension cable (Or multiple cables) to the shed and still have useable power? Or is it just too far away to be realistic/safe? Are there any alternatives? Our last resort is to hire a generator but as we will be shooting for close to a week this will add a significant cost to a very stretched budget and also provide noise issues. We will need at least 3000W usable power to create the lighting set-up desired. Best bet go to a rental company and ask for a Super quiet / Sound Attenuated Generator. What you don't want is contractor grade sets as they will make lots of noise. Honda (at least in Canada) has some "wheeled" models that are 4000 and 5000 watts each and put out 68db. People use these for their motor homes and cabins. A 'studio quiet' generator may be your best bet, and should not be that $$$ for a weekly rental rate. As MBhydro stated...stay away from any regular contractor style generators for noise issues. BTW, Welcome to ECN Forums!!! If you ran a 10-8 gauge (6mm-8mm) cord for each 20a circuit the voltage drop would not be horrible and the only real downside might be the lights a little dimmer/yellower than you are used to. You would be borrowing or renting them too. That will not be a cheap cord to buy. A buck-boost transformer -- back near the power source would permit you to run your stuff at a suitable voltage and without using super sized cords. To perform the calculations -- get a real electrician. Instead of expensive cable, consider running a PVC raceway on the ground and using common as dust THWN-2 type insulated wire -- #10 would do. The key thing is to use a boosted voltage. Said voltage would drop at the point of use -- but still be in the right range. This works because you are either all on or all off. A very lightly loaded system will have you with excessive voltage. Buck-boost transformers should be rentable, too. You'll probably want 240V bumped up 8% or some such. If the rate is okay, you can buck-boost into extension cords -- #10, too. They can handle the boost without trouble. I happen to have a couple of such single phase transformers -- and have been using them with extension cords for ever and ever. They are multi-tap -- and I've set them up for 208 to 240 AND 240 up to 277. Yeah, it's the same ratio of boost-buck. How loud is one of these silent generators? I don't really understand Db. I can hire a 6500W Honda silenced generator for a decent price but I'm scared it will be too loud, especially at night. And that I will have to have it a similar distance away anyway therefore having a distance problem again. Would I be able to get away with a 2.5mm or 4mm cord per circuit? And at the end of this would I be able to connect an RCD to then distribute to multiple lights? The boost-buck transformer sounds promising but I wouldn't know where to get one or how to use it. Also, what is a PVC raceway? at 20A and 230V 1ph for 100m I guess you'd end up somewhere in the 6-10mm2 range to keep voltage drop at an acceptable level. For 3% voltage drop I get 10mm2 and I really wouldn't recommend any more than that voltage drop since you can have as much already in the fixed wiring, i.e. a total voltage drop of 14V under full load - could be noticeable with lights and you'd heat the air with your cords. However, that's assuming full load on each cord. I guess your second best bet is to combine several lights of no more than say 500W each and connect each to its own 2,5mm2 extension cord. That should keep voltage drop within acceptable levels and the cords should be easy to get by. Don't piece together short pieces though, use two 50m pieces max. 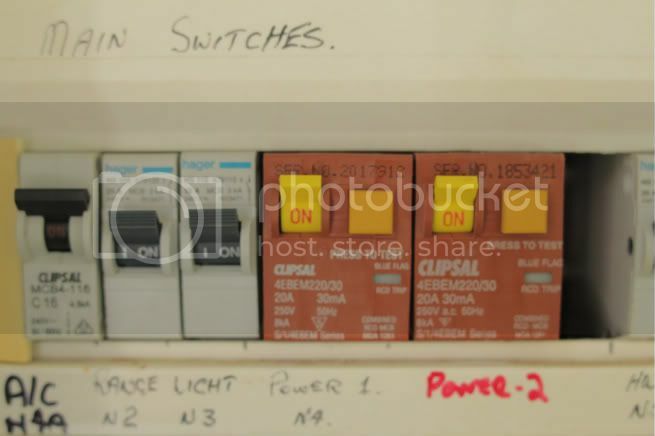 It looks like the board at the house already has RCDs (though I don't know how they're connected), connecting another RCD at the end of the extension would cause problems in case of tripping (either both trip at once or either, unpredictable which one). I'd recommend to check what the RCDs control and only use those outlets. I did a little looking online last night and the Honda Gen sets I was talking about are rented here in Canada by both of the major movie equipment suppliers under their quiet generator heading. They were first designed to be used at campsites and in motor homes so they should be quiet. Looking at some reviews of them in caravan / camping websites the sound is described by people as a low hum. Before you rent it, do you have the time to go to the rental company and see if they will start one for you. That will let you hear it before you put your money down. Ok. I will look into getting some 10mm2 cables made up for me, but I'm assuming they'll be expensive. The most powerful light I will be running will be 2000W, but mostly 1ks and a few other incandescents. So instead of having an RCD at the end of the cable run could I just have a power board of some sort? So I can run a few lights per cable. In terms of the generator, a low hum sounds like it could be dealt with. I have a rental company near me so I will also check out some of their silent generators. If your going to a rental outfit that deals with contractors they should have both heavy gauge extension cord and spider boxes (distribution panels) for rent as well. No use having to pay to get a cable made up when you can rent it.